How can i have a copy of it and it cost? a. You can come to my contact address above to purchase your hard copy. b. I can send you a soft-copy of it to your email address, from their, which you can download and save into your android phone (Techno, Samsung, HTC, LG), Blackberry, Laptop, Desktop, e.t.c view or printed out and study in your quit time. c. If you stay very far, i can send it to you, through any of the transport line listed below. These transport service should be operating at your state. First, give me a call to confirm if the past Questions can get to you. After payment of the said amount for the Soft-Copy N500 or Transport Delivery N2000 to the bank account i sent to you on request. send an sms in this format displayed below to 08051311885. Enter a Bus going to Enerhen Junction fee is N80&gt;from Enerhen Junction enter a Taxi going to Estate fee is N50. tell the driver to stop you at Cinema Junction by Ejemudarho Street, fee is N50, when you are there, ask of Easco Table Water building or call me. Enter a Keke-napep or Taxi going to Estate, tell the driver to stop you at Cinema Junction by Ejemudarho Street, fee is N30, when you are there, ask of Fasco Table Water Building or call me. Enter a Keke-napepe or Taxi going to Estate fee is between N50-N100 &gt; from Estate, enter a Keke-napepe going to Robinson Plaza or Deco tell the driver to stop you at Cinema Junction by Ejemudarho Street, fee is N30, when you are there, ask of Fasco Table Water Building or call me. Enter a Keke-napepe or Taxi going to Estate fee is N50, from Estate, enter a Keke-napepe going to Robinson Plaza or Deco tell the driver to stop you at Cinema Junction by Ejemudarho Street, fee is N30, when you are there, ask of Fasco Table Water Building or call me. Answer: Yes, Maximum time is 20 minutes. but you have to come before bank close, latest 2pm you are already at my office. Please, what other institutions do you register/processed form for and their post utme past question and answer you have. Debit Cards on Interswitch or e-Tranzact PIN (Payment Voucher). A copy of print-out of venue and seat number. Biro, 2BH or 4B: Pencil and Eraser. exercise in the University on the days and venues indicated below. Note: Candidates are to check their Examination venues on AAU c-portal on Tuesday, 10th of August, 2015. Candidates are expected to report at the venues of screening at 7:30 am prompt. Candidates will be screened in subjects relating to their First Choice course of study in Ambrose Alli University, Ekpoma. 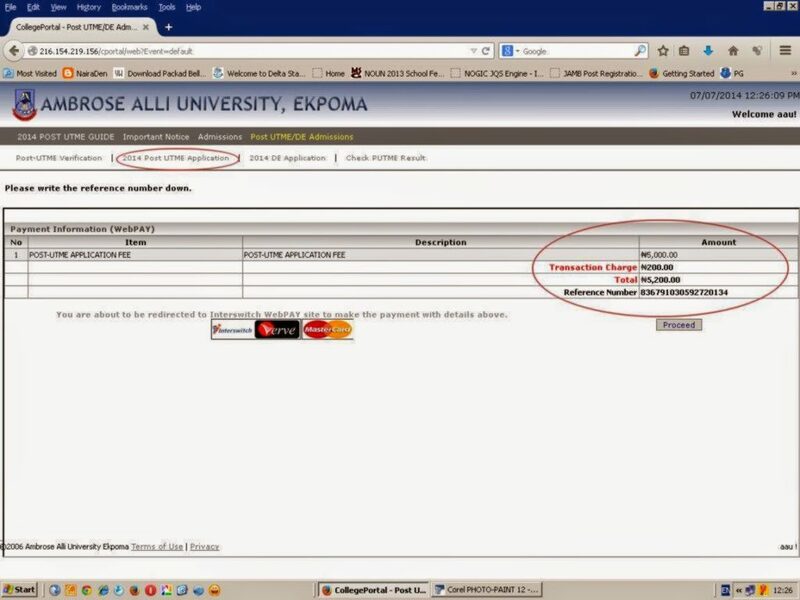 Applicants are required to pay for the Ambrose Alli University, Ekpoma Post UTME on-line application form at a fee of #3,000.00 (Three thousand Naira) only using their ATM Debit Cards on Interswitch or purchase an e-Tranzact PIN Payment Voucher) from any of the under listed Banks Nation Wide. Only candidates with their names on the cPortal as uploaded from the JAMB Institution of Choice list and with a score of 180 and above are eligible to make payments and also participate in the Ambrose Alli University post UTME screening exercise. their ATM debit cards on Interswitch or at the designated banks for the purchase of the eTranzact PIN. form with their payment details. 1. UTME e-registration slip and UTME result slip for sighting and admission into the examination hall only. 2. HB pencil, eraser and biro. 3. 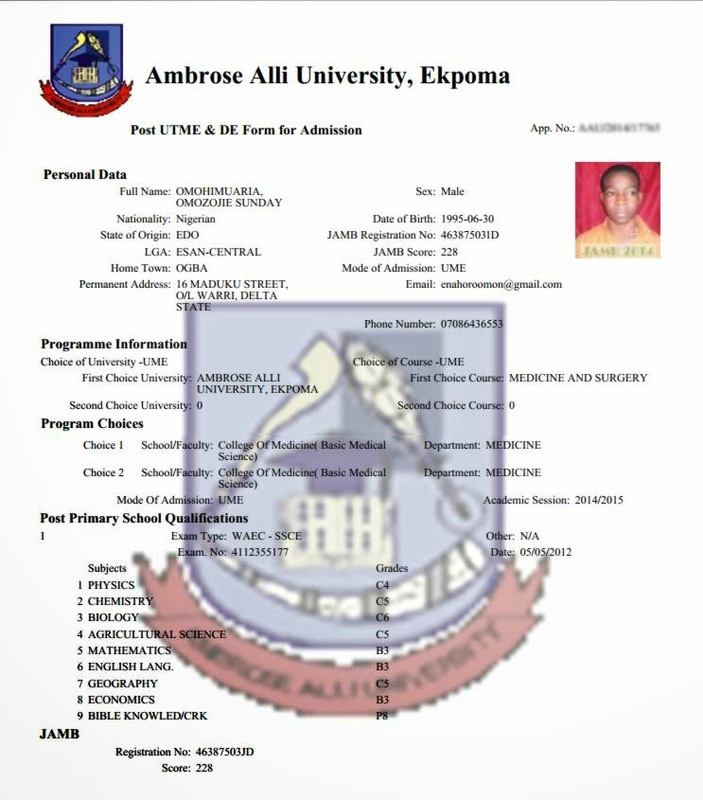 A print-out of the duly completed post UTME Online Application form. Please be informed that there shall be no Direct Entry into Medicine, Nursing, Medical Laboratory Science and Law. All Direct Entry candidates who applied to JAMB for admission and chose Ambrose Alli University, Ekpoma as Institution of First Choice are also required to complete the Online Application Form for their screening exercise. All such candidates mustupload scanned copies of all relevant certificates/documents to the c-Portal. *Screening Exercise for Direct Entry (DE) candidates is scheduled to take place from Monday, 24th August, 2015 to Friday, 28th August, 2015 from 9.00 a.m. each day. Please, be informed that there shall be no Direct Entry into Medicine, Nursing, and Law. Examination study guide: #2,000.00 (Two thousand Naira) only Technology fee: #1,000.00 (One thousand Naira) only; and Bank charges will be charged at the point of purchase of forms online via ATM Debit Cards on Interswitch or e-Tranzact PIN (Payment Voucher). Contact us at our office for information's on NDA(Nigeria Defense Academy) the form is out now for 2013 call phone number on +2348154053024 to get inquiries. i know you cant rember me, u process my aau post ume form last year. i ws able to gained admission. I was searching on google when i came across ur post on aau post ume. my younger sista fil in aau. i wnt u 2process it. pls take her as u candidate, i will mke efort 2com and collect past question frm u, when i will come to warri you will recongnise me when u see me. Hello Mr Charles please do you Know if AAU will be accepting combined results this year 2014? Please reply back coz it's urgent,I want to register with u and I have ur # now and besides I am a Delta state's Indegene from Ika North East LGA, Ekwuoma Town,Umuosi Quarters..My name is Victor GodsGlory Obi. Thank for helping me out to process my post utme form.